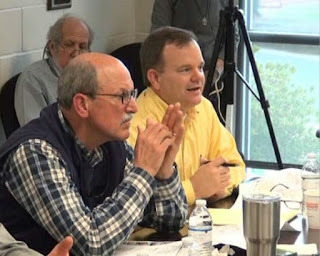 Oconee County officials changed course yesterday (Wednesday), focusing their attention at a meeting on water and sewer issues less on the proposed upgrade to the Calls Creek wastewater treatment plant and more on the possibility of building a sewage plant on the Middle Oconee River. That report recommended expansion of the Calls Creek plant but also construction of a new Middle Oconee River facility. Haynie said the Middle Oconee plant could start small and be expanded later as need arises. The major obstacle is cost, with Haynie telling the Board that even the expansion of the Calls Creek plant to 1.5 million gallons per day, which he estimated a year ago to cost $7 million, now is expected to be $13.5 million. Wednesday’s was the third work session the Board of Commissioners has held this month, and the longest. The first session on Jan. 6 ran a little over two hours. The second on Jan. 10 lasted just an hour. Wednesday’s session featured the presentation by Feldman, a partner at Engineered Horizons of Duluth, Jimmy Parker of Precision Planning of Monroe, and Robert Ori of Public Resources Management Group of Maitland, Fla. All are consultants to the county. Haynie moderated and added comments as the presentations progressed. The discussion covered a wide range of topics, from data on use and projected use of the county’s water and sewer services, plans for not one but two new water towers, the county’s sewer collection system, and the rate structure for services provided to customers. A simple message that ran through the meeting was that the county has adequate sources for the water it will need in the future. The county is exploring purchasing additional water from the Bear Creek Reservoir in Jackson County, a partnership involving Oconee, Barrow, Jackson and Clarke counties. Another option is working with the three counties to expand treatment plant capacity. 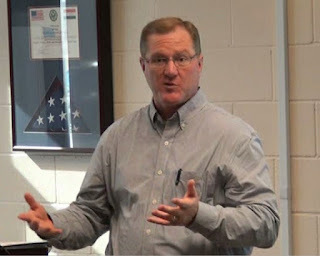 The county also is a partner with Walton County on the Hard Labor Creek Regional Reservoir, but Feldman noted that pumping the water from the reservoir now filling in the far southern end of Walton County to Oconee County will be an expensive enterprise. Things are quite different on the sewer side. “We are in urgent need of additional capacity,” Feldman said, and upgrading Calls Creek to 1.5 million gallons per day quickly is essential. She also laid out three options to get to the 5 million gallons per day of treatment capacity she said the county will need by 2050, and all involved a plant on the Middle Oconee River. Option 1 involves abandoning the Land Application Site on Rocky Branch Road, keeping the Calls Creek plant at 1.5 mgd, and building a plant on the Middle Oconee with 3.5 mgd of capacity. Option 2 involves abandoning the LAS site but building a 1 mgd sewage plant on that land with discharge to Barber Creek, keeping the Calls Creek plant at 1.5 mgd, and building a 2.5 mgd plant on the Middle Oconee River. Option 3 would have a single plant of 5 mgd on the Middle Oconee River. Haynie said the county could expand the Calls Creek plant to as high as 6 million gallons per day, but it would have to find a way to discharge effluent higher than 1.5 mgd in some fashion. The proposed pipeline down Calls Creek to accomplish that has produced strong pushback from residents along the stream. Parker told Haynie there is another problem with plant expansion. The feeder system going into the plant can only handle 2 million gallons per day of flow, he said, so that system, including the force main at Epps Bridge Parkway, the line down Daniells Bridge Road, and the collector at Lampkin Branch, all would have to be upgraded. Upgrades currently planned will not get the system beyond its 2 million gallons per day limitation, he said. Parker in his discussion focused on the sewer collector system, presenting a map with a variety of options. Jimmy Parker Of Precision Planning Inc. The county is in the process of building a collector system to run from Epps Bridge Parkway to Bogart, where sewer lines inside the city are in the works. That will bring additional sewage to Epps Bridge Parkway, where it currently is being pumped to the Calls Creek plant. The county will need to build a sewer line from Epps Bridge Parkway along McNutt Creek and the Middle Oconee River to a proposed sewer plant site on the Middle Oconee River near Simonton Bridge Road. Parker estimated the cost of that line at $14.9 million. The county has not purchased any property along the river, and Parker proposed another site further downstream and closer to Barnett Shoals Road as an option. To get to that site, the county would have to spend an additional $8.7 million on a sewer line. The Commission broke its session into three parts, with the session after lunch focused on a financial analysis of the operation of the Utility Department. Ori of Public Resources Management Group said the base rate structure for water in the county is sound, but he recommended simplifying the steps above the base water rate, with the likely consequence being increased costs to users. Ori also said that water users at present are subsidizing sewer users, and he recommended increases in the sewer rates to address that problem. The county owes $9 million on a bond issued in 1998, $5.8 million for bonds issues by the Upper Oconee Water Basin Authority for the Bear Creek Reservoir, and $27 million in bonds and loans for the Hard Labor Creek Regional Reservoir. Ori recommended the county pay off the $9 million as soon as possible to better prepare itself to issue future debt. The video below is broken into three parts. The first part, ending at 1:11, includes the comments of Feldman and an overview of the proposed design of the Calls Creek plant by Haynie. The second part, ending at 2:08, contains the comments of Parker and questions from the BOC members. The third part includes the comments by Ori. The meeting ran from 9 a.m. to 2 p.m., but a bathroom break and the luncheon break have been eliminated from the video. OCO: BOC Work 1 18 17 Complete from Lee Becker on Vimeo. "The county also is a partner with Walton County on the Hard Labor Creek Regional Reservoir, but Feldman noted that pumping the water from the reservoir now filling in the far southern end of Walton County to Oconee County will be an expensive enterprise." "The county owes $9 million on a bond issued in 1998, $5.8 million for bonds issues by the Upper Oconee Water Basin Authority for the Bear Creek Reservoir, and $27 million in bonds and loans for the Hard Labor Creek Regional Reservoir." "Ori also said that water users at present are subsidizing sewer users, and he recommended increases in the sewer rates to address that problem." could not agree more - the exploding new commercial developments should bear the largest share of these costs. As usual, thanks Lee for all your work. I only attended part of the meeting so can only comment on my impressions of what was said during that time. 1. Haynie strongly implied that they would like Calls Creek to handle the full 2 million gallons that could come to the plant. 2. Haynie showed the Calls Creek plans and noted it could go to 3 million gallons a day. Given current arguments of time to get additional capacity online and cost, I think we will see a push for this to happen one day. 1. Do you have details on how (in one year) the cost estimates went from $7 mil to $13.5 mil? 2. Was there any talk of a need to slow growth so that we have time to do this expansion the best way versus the most expedient? You are quite correct. Haynie did talk about increasing the Calls Creek Plant to 3 MGD and even 6 MGD. And he did say he thought the creek could handle 2 MGD, though he did not say a request to EPD for that allocation will be made. Clearly these options remain on the table, as is the option to run a sewer line down the creek. Parker mentioned that option in his talk. No one has explained why the cost for the upgrade has gone from $7 to $13.5 million. The original estimate was just that. Actual design work now has been done. Commissioner Horton did raise the question about whether it made sense to rezone property that needed sewer capacity under the current circumstances. Why would the leaders in charge of the county spend almost $30 million on the Hard Labor Creek Regional Reservoir if it's going to be expensive pumping the water from the "far southern end" of Walton County here to Oconee? How much more, and was this taken into account at the time? The problems of distribution were known at the time. The vote was split, with current Commissioner Chuck Horton and former Commissioner Margaret Hale voting against it, and former Commissioners Jim Luke and Don Norris voting in favor. The Chairman Melvin Davis, a proponent of the project, broke the tie in favor. This is an old post, but it gives some of the background. Sorry if this is "knee jerk". Almost ten years ago in March of 2007, Board of Commissioners Chair Melvin Davis and Commissioners Don Norris and Jim Luke made a $30 million dollar bet on the Hard Labor Creek Regional Reservoir that the county would grow at a 30% population rate, with a county population of approx. 67,000 in 2015. Commissioners Margaret Hale and Chuck Horton forecasted a modest rate of 13.4% growth with a county population of 38,000 in 2015. Again, a $30 million plus bet, not counting the added cost of getting that water from southern Walton County to Oconee. Melvin, Luke and Norris mad a bet for over $30 million, and were WAY off. Lee Becker brought it to our attention then, and its even more pertinent today with the Lance Haynie recommended million dollar investments in sewer expansion. Between the over $30 million bet on the Hard Labor Creek Regional Reservoir, and over $20 million for the Caterpillar plant, that's over $50 million in "bets" that have not panned out for a conservative Republican county of less than 40,000 people. $50 million in just two investments with little return on investment, and more money needed to be spent on getting water her from the reservoir. Quite a legacy left by Melvin Davis. If memory serves correct, there were 2 other proposals for land for water that were closer. One in Walton Co, and one in Oconee that were smaller and less expensive and we "Oconee" would have owned all of it and gotten all of the water, and the volume of water would have been the same as Oconee's water percentage from Hard Labor Creek Reservoir. At that time, the State wanted more Regional reservoirs instead of local and it was easier to get a permit for regional reservoirs. Melvin pushed for regional as did the Walton Co. Comm. Chair. It was later rumored that there was a large tract of land bought that would front onto the reservoir for a subdivision that some considered "Insider Trading" and that might have played into the decision of where to put the reservoir. Also if my memory is correct if Walton Co. decides not to participate any longer in Hard Labor Creek reservoir we Oconee Co. have to assume ALL cost and are responsible for all debt incurred by the reservoir. Two other sites were under consideration, one in Walton County and one in Oconee County. The speculation about land ownership was part of the discussion. As far as I know, each county is contractually bound through intergovernmental agreement to pay its share. for Oconee County, that is 29 percent.